1. 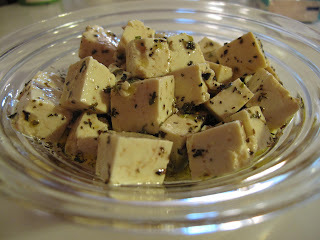 Cut tofu into cubes. 2. Mix all the ingredients in a bowl, add tofu last. 3. You can use more herbs if you like. 4. Let the feta marinade in a refridgerator at least couple of hours, preferably overnight. Feta is great in Greek salad or on top of a pizza! You can use the marinade later also for example as a salad dressing.